Is it still a birthday lunch if it’s 7 weeks late? Due to my birthday being on the cusp of exams and whatnot, it usually takes another good month or so before I manage to find time for a leisurely celebratory meal. But even if it no longer counts, there is no way I’m passing up on Chris’ promise to take me to Chin Chin for my birthday. And now that we’re already half way through our break (what, REALLY? ), we picked up our metaphorical skirts and dashed to Chin Chin before uni could creep up on us again. Any minute now, Chin Chin will be added into the dictionary with the definition of ‘a long wait to be seated, esp. in a restaurant. Synonyms: Mamasita’. A pharmacist at my work tried to go with a few friends on a Monday night and was turned away with a two hour wait! So it was pretty nifty that we were seated within two minutes, despite having arrived during the lunch hour. Birthday luck YEAH! It does get a little cramped and very loud during mealtimes, with barely a hand span between tables, and nothing to soften the conversation bouncing around the high warehouse ceiling. Shouting is therefore encouraged, I suppose. Having had the delectable Kingfish Sashimi last time, I decided to make like a foodie and try something else. I’ve been craving Peking duck like mad recently, but until I can get to Old Kingdom to stuff myself on three courses of duck, I’ll settle for the Chin Chin Pork ‘Roll Ups’ ($18) instead. The Pork Roll Ups consisted of a small mound of shredded suckling pig, an herbaceous salad, and four tissue-thin pancakes served DIY style, which is half the appeal. I was impressed with how spice-happy they are in the kitchen, seasoning the salad generously with all manner of Asian herbs (coriander, thai basil, mint) and a hefty dose of chilli and vinegar. The result is a sharp and zesty salad that goes hand in hand with the tender pork and sweet cinnamon sauce. They should serve a main-sized version of this. Another must-try dish is the Son in Law Eggs ($8 for 3). Whilst the golden exterior and lusciously creamy innards can’t be faulted, the chilli jam is rather salty and heavy, ruining the delicacy of the runny yolk somewhat. But that issue could easily be avoided by simply serving the sauce on the side. Eager for something even half as good as the Pork Belly at Red Spice Road, we decided to order the Caramelised Sticky Pork with Sour Herb Salad and Chilli Vinegar ($26). On one hand, the large slab of meat was marinated and braised until it was sticky and falling apart, with ample crackling still on top. But on the other hand, the slow cooking must have rendered all the fat, leaving it tender but not as unctuous as I would have preferred. The salad served on top was very similar to the one served with the pork roll ups. However I was less impressed with it here; as much as the sour and spicy flavours cut through the richness of the pork, the boldness of both the meat and the salad left me reaching for the Jasmine Rice ($3 per bowl) to diffuse all the heaviness. Don’t get me wrong, it’s a tasty dish, but it fell short of being truly impressive. 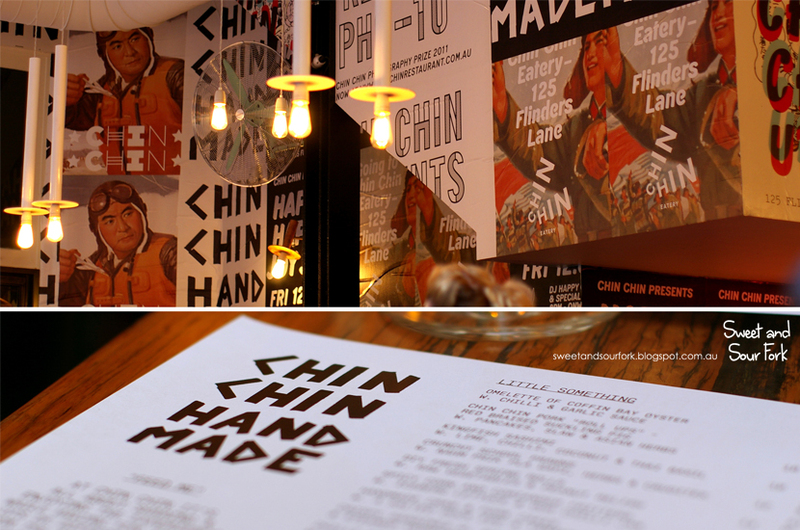 The food at Chin Chin is pretty nice with some stand-outs such as the kingfish sashimi and pork roll ups. It’s refreshing to see a modern/fusion Thai restaurant that doesn’t shy away from the spices (too much). The appetisers are moderately sized but the mains are quite large; it may not look like we ordered a lot of food, but we were both quite full by the end. I’m not itching to return, but I would be more than happy to. Rating: 14.5/20 – herbaceous and vivacious. Instead of taking our chances with the desserts at Chin Chin, which all seemed rather heavy after our substantial meal, we migrated a couple of blocks down to Dessert Story, continuing the Asian theme. Specialising in Taiwan and Hong Kong desserts, the menu at Dessert Story is so Asian that it gets straight A’s whilst neglecting the arts and trying not to lose face for the family. Dessert Story seems to be a popular destination any time of the day, but especially so in the early afternoon, where there is a 15% Off Happy Hour. Chris is almost completely used to being the only Caucasian in a restaurant by now. Flipping past pages upon pages of black glutinous rice, grass jelly, peanut soup and red bean dumplings, we settled on a signature dish, the Milk Snow Ice with Crystal Jelly and Mango Juice with Popping Pearl ($9.9). Not usually being a fan of Asian desserts, more due to over-exposure than actual dislike, I was surprised to find this absolutely delicious! The enormous mountain of snow ice in the middle was amazing, tasting like ice cream but impossibly feathery and fluffy, just like fresh snow. The mango jelly and juice were sticky and sweet, and the popping pearls could be passed off as caviar, except it pops in the mouth with a burst of mango flavour. But really, no need for anything else, just give me a big bowl of the snow ice please! Rating: 14.5/20 – snow in a bowl. Phwoar, now I know what I need to order when I get to Dessert Story!! That sounds perfect. It is so very perfect... as is everything else on the menu! I visited the dessert story in Glen Waverley recently (review pending), and found their sago in coconut to be really good too! I should have ordered the pork dishes that you ordered at Chin Chin, I reckon I would have liked those better. I did find most of the dishes tasted a bit similar with similar spices and herbs, but of course still tasty.. I went to the Dessert Story in Glen Waverley, loved the shaved ice dishes :D Making me crave for some! I definitely agree with them tasting fairly similar, though I suppose the menu is big enough to sample a wider variety of things without overlap, if you're careful about what you pick. I still can't believe you two finished all that food though! I'm surprised the waiter/ress didn't stop you!